Sweet Creations Blog Train "Roses Are Red"
There's another train pulling out the station. 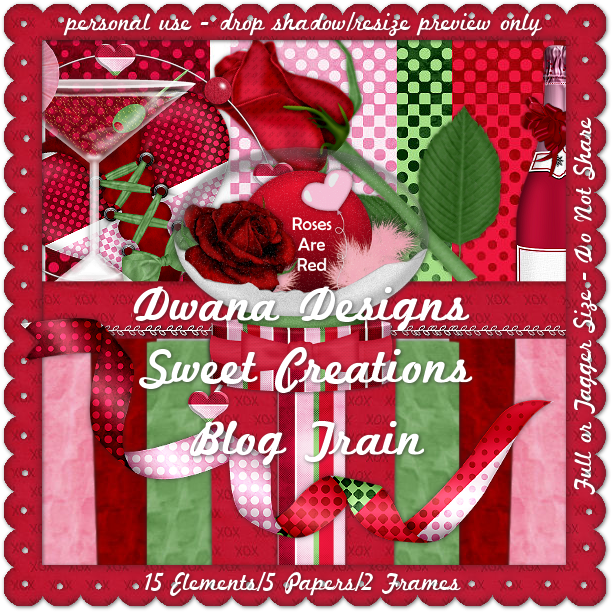 Sweet Creations Blog train!! 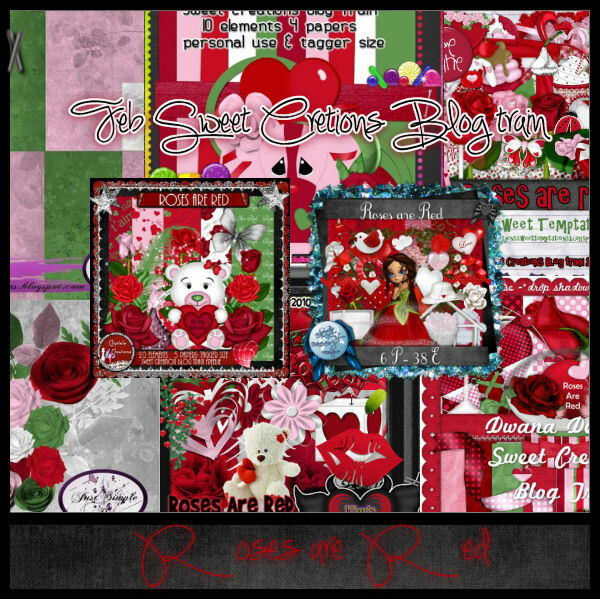 The theme is "Roses Are Red" and below you can see the entire train preview. Be sure and stop by the other stops and grab some goodies as well, please be kind and leave some love some for the designer's time, talents, and generous natures! 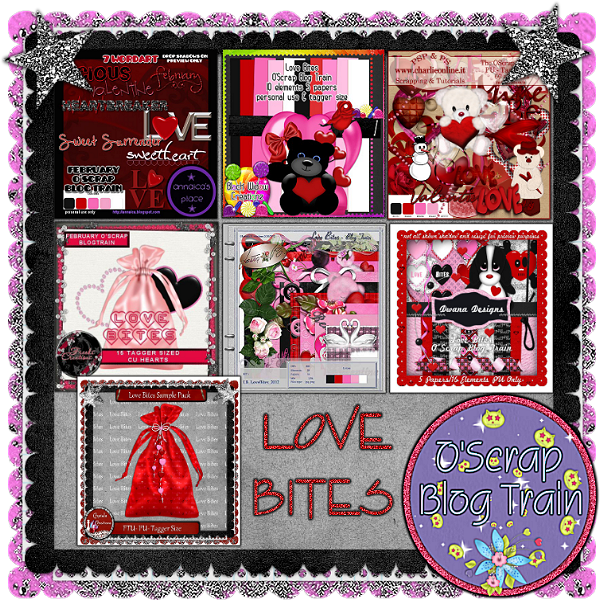 O'Scrap Blog Train "Love Bites"
I've joined a couple blog trains..made some new mini tagger kits. The O'Scrap "Love Bites" Blog Train is leaving the station!! Above you can see a preview of the entire train. Below you can see a preview of the tagger size mini kit I made for it. Check out the rest of the stops below and be sure to show some love for the designers time, talents, and generous natures! Keep in mind we are all on different time zones so some links may need a check back later. Enjoy the ride and the goodies! 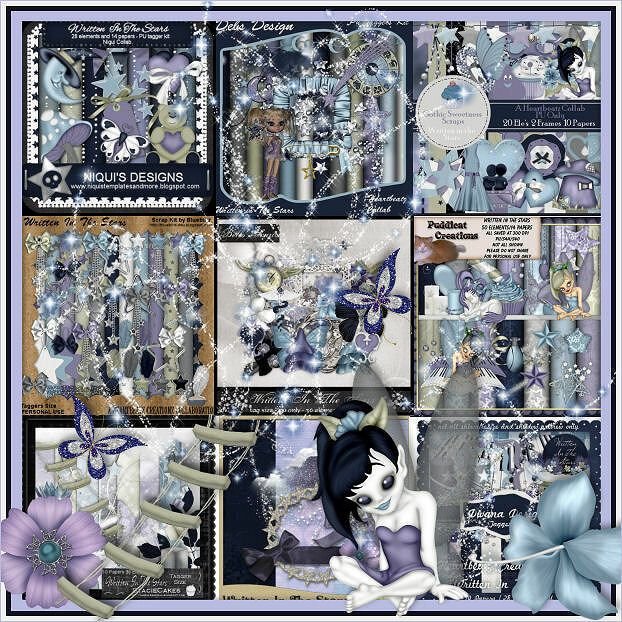 Get this gorgeous collection of stunning tag size kits absolutely free with just $5 purchase! Be sure to stop by in February and grab it before its gone. 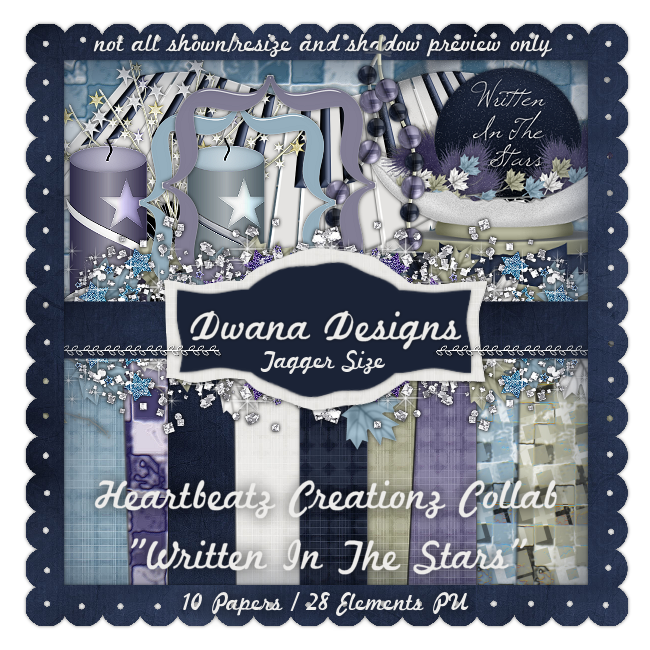 Popping by to share the news - New Misfit Collab Templates are postedand I had the pleasure of being partnered with Deb of Creative by Nature.This is our preview and you can grab it over at the Creative Misfits Creations blog. I hope today finds all having a great day. It is very nice here in North Texas, doors and windows opened - all dogs outside enjoying the fantastic weather. I popped online today to find this gorgeous tag with my name - Thanks Jeannine! 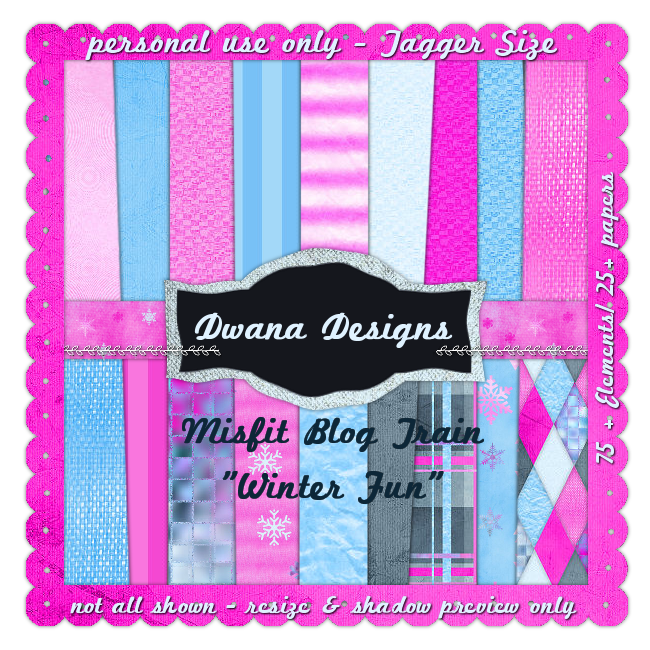 and you can find her wonderful tutorial on her blog "Winter Cheers" .It uses my FTU Scrapkit from the Misfit Winter Fun Blog Train. You can also grab some mighty cute extras from this tag at Funky Sweet Designs! Thanks for using my portion of the Misfit Blog Train, Jeannine! Please be kind and leave some love when downloading! Thank you Kaci and Justinefor organizing this for us all, I had a blast creating for it! ------------------------------------------------------------------------------- Here's the other stops on this train's first trip down the rails!Please check back if a designer doesn't have their part ready,as we are on different time zones. 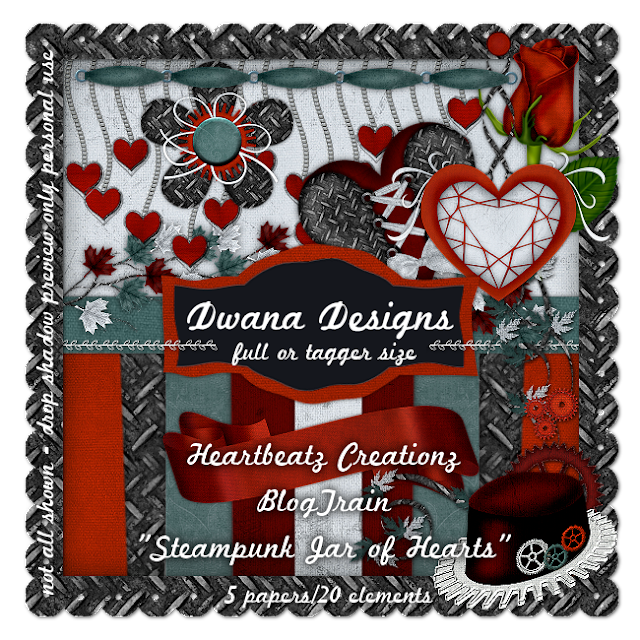 This months theme is "Jar of Hearts"
I made a full and tagger size mini kit for personal use only. This kit contains 5 papers/20 Elements including a couple frames. The rest of the train depots are listed below, be sure and leave some love for the designers time and free sharing natures :) Please remember, we are all on different time zones, if someone doesn't have their part of yet check back with them later. I musta found a lil bit of the mojo fairy! and this layout came out from one of recent kits. As most of you can tell by my blog dates, I have taken a month away from designing - NOT because I wanted too, but more to sort out recent months of drama that my name was not in but I sold through the business it involved. I returned to designing a few months ago under a new screenname and design name. For personal real life reasons, I chose to walk away from my 10 year plus screenname. I had no choice but to change names in the matter, my estranged family were doing their best to cause me issues online. We are all entitled to chose the battles we fight and how those battles are fought. I chose to NOT TO FIGHT, rather stand by my beliefs and knowledge in right or wrong and move on. Before this change, I was a forum moderator for an artist, a script tester for the artist's main customer service people - who also have their own digital design business. For the better part of nine months, I devoted ALL MY TIME AND EFFORTS to JUST THESE PEOPLE! I did my best to cover for other team members when their lives called for them to be away from computers and never once did I complain about it. I DID voice my opinion when certain team members were taking advantage of my good nature. I've been used and screwed over like many within the PSP Community. Standing up for myself is all I have to combat it. Short story of drama is I had to make a decision about what online activities I stayed involved with because of personal life and being a college student at my age. Yes, I hated making the decision and yes it may have taken me a little longer than should have to make the decision, but it broke my heart to give up my position in the artist forum - was my favorite artist and we all know how we can feel about our favorite tube artist. Well, the response I received from the people I trusted and believed in was "ALL YOUR SERVICES ARE NO LONGER NEEDED" I stepped down from moderator - not everything I was involved in. But their response caused me to walk away from everything I was doing online because they had a hand in everything I was doing. I was making friendships I thought - apparently I wasn't afforded the same benefits they felt they were owed or due! When I returned to designing, I signed with a man and his company to sell the kits I design from scripts, templates, and various other CU resources that I have either earned, won, or purchased myself. These prior individuals decided to contact me via email and attempt to bully me into NOT USING their scripts I earned fair and square. I contacted the business I was selling through since the products were in their store and was instructed to follow the business chain of command regarding the accusations. I spent two entire days doing nothing but screen printing EACH AND EVERY SINGLE EMAIL I EVER RECEIVED FROM these prior people. And by that capitalized font - I mean ALL ORIGINAL EMAILS WITH ORIGINAL FILES AND INSTRUCTIONS INTACT! I screen printed the blogs with my name and link under SCRIPT TESTER! I was then instructed to email all to company and it would forwarded to company attorney on my behalf with my response. Needless to say, the man, the general manager, and the company all turned out to be lies. There was no company attorney and I was not informed of the lies until this past month. The information I was giving about being lied to by the no longer present company is what set this post and my MIA'ness this past month. Since it was not properly addressed as a business should address business problems...I am addressing my portion now. I have always been TOU complaint unless I have permissions to do otherwise, and for the record I hold a couple of special permissions I do not have to divulge. The designers who gave them know they gave them to me and have seen my finished work before it was listed to be sold just incase they wanted me to do something differently. And both designers have praised my TOU complaintness -- and their view of me and my creations means more to me than those prior peoples view. I will continue to design with ANY AND ALL legally obtained CU resources I own. I WILL NOT BE BULLIED nor did I blatantly disregard their response. I responded immediately and have the saved file to share if they are interested in seeing it. They have my email address and can request it there ONLY. I currently am listed in three stores and I will handle any business I need to handle from now on. I trust the people I currently am involved with, but feel it is my duty especially after prior treatment to address my business myself. Now - stop stalking my creations because no amount of harassing me is going to change what I am doing!